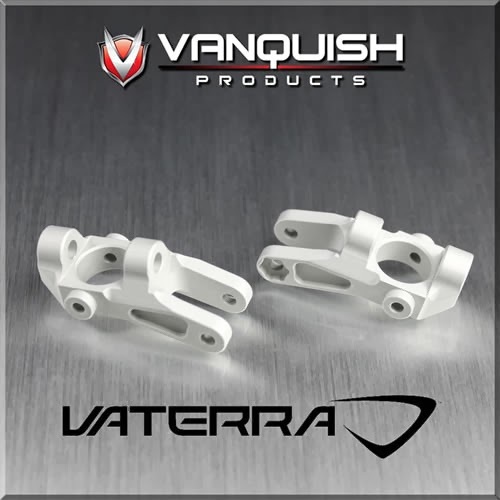 Vanquish Products has two new parts for the Vaterra Twin Hammers. First is the Front Spindles/Steering Knuckles. They are available in two colors: Black (part# VPS06951) and Silver (part# VPS06950). Vaterra Twin Hammers HD Front Spindles by Vanquish Products. Unique Design allows ultra light weight performance. Interchangeable steering arms For zero ackermann Steering geometry. Zero Ackerman steering arms available soon. Increased size 11 mm exterior Bearing for extra heavy duty performance. Dust Finished and hard anodized for lustrous lasting looks and wear resistance. Next is the Castor Blocks. They are also available in Black (part# VPS06956) and Silver (part# VPS06955). 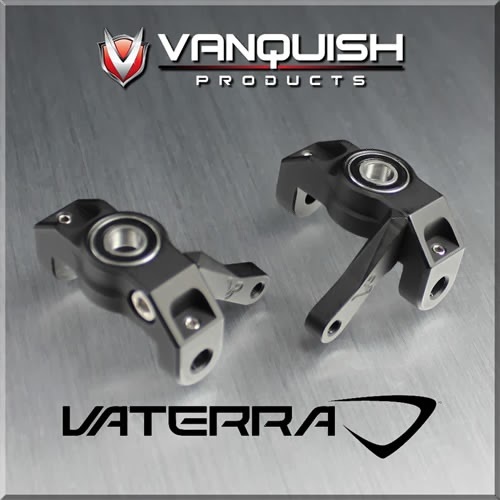 Vaterra Twin Hammers HD 15 degree Front Caster Block Set by Vanquish Products.